I still remember until now the feeling that I've felt when I first saw the Magellan's Cross. I was ecstatic to see it in person! I only see it in history books and now I've come to see this famous tourist spot of Cebu. It is actually one of Cebu's famous landmarks just in front of Cebu City Hall and I've noticed that it is included in the city hall's logo. It is the most popular church in Cebu and tourists flock the Basilica every January and I remember a friend of mine who is a devotee of the Sto. Nino goes there with his whole family every year to celebrate. The original church is said to be built on 16th century at the actual spot where the image of the Sto. Nino where found by the Spanish explorer in 1565. But the original church was damaged by the fire and so was the second church that built in the same place. The present basilica was said to be constructed in 1740. I hope that there won't be any more fire to damage or ruin this beautiful church. The image of the Child Jesus - Sto. Niño the patron of Cebu is housed in this side of the chapel so that devotees can have a closer look and say a prayer to the Sto. Niño. Though not as popular as the Basilica Manore del Sto. Niño, this is the capital church of the Archdiocese of Cebu. I love the facade of the church because of its barouqe architecture. The altar of the cathedral highlight the image of Jesus on the cross. On the left is the image of San Lorenzo Ruiz the first Filipino saint and right is the image of Blessed Pedro Calungsod a Visayan martyr. After visiting those places, it's time for our breakfast in Cebu. We went to a nearby Chowking restaurant because we were really hungry already. 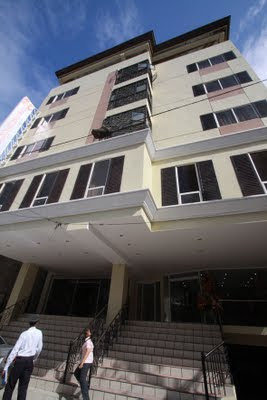 After our breakfast, we went back to our hotel (Sampaguita Suites) which is just a walking distance from those places above. The room is cheap and the service is good.